Street Tacos are all about the meat. Here is my favorite recipe. 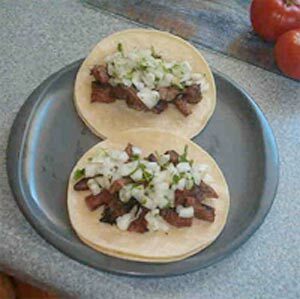 Carne Asada is steak - however, feel free to substitute chicken or pork in this delicious recipe. Put marinade in a large freezer bag, along with the meat and get enough air out of the bag so the meat is completely in the marinade. Now, so far as time, I’ve sometimes only marinated the meat for a few hours. Mostly though, I like to let it sit in the refrigerator for two days. I’ve read that the citric acids break down the meat, and it does seem to be more tender the longer you let it sit. There is nothing more than white onion and cilantro. Dice up a whole onion and mix in ¼ cup of chopped cilantro.